Prior to his marriage in 1762, he lived in Stillwater, Saratoga co., New York. He married Submit Purchase, daughter of Jonathan Purchase and Margaret Worthington, on 27 Jan 1762 in Springfield, Hampden co., Massachusetts. Submit was born 22 Jan 1735 in Connecticut. Between 1783 and 1786, James and Submit moved their family to St. Johnsbury, Caledonia co., Vermont, being the first settlers in that area. They loaded their boats at Springfield, Massachusetts. These boats had rafters covered with canvas and blankets to protect their belongs, which included their furniture, a large clock, a spinning wheel and loom, chests of their bedding, clothing, and provisions for the trip. They rowed upstream on the Connecicut river, to the Passumpsic River, then to the West Branch, where they stopped, thinking they were at Littleton, New Hampshire, their intended destination. They decided to stay, settling on "Benton's Meadow". His father James, and brothers Jonathan and Martin also were granted land there. It is said that they were going to Littleton because James won land in Littleton in a singing contest. The song he sang was "Brave Wolfe", written by his son Jonathan. A descendant is said to own a copy of this song in it's original handwriting. Another descendant states that the family went from Massachusetts to Tinmouth, Vermont about 1774, when sons James, Martin and Jonathan were in the Revolutionary War, and afterwards were granted land rights in Littleton township. While Martin's Revolutionary War pension file does not mention land grants, it should be noted that he entered the service from Tinmouth and mentions his father's home there. They built the first home, made of logs, using a mud/twig mixture for caulk, and a pine bough roof. Oiled paper covered the windows. They slept on beds of pine and spruce boughs, and bear skins provided rugs for the floor. Not surprisingly, they also were responsible for holding the first religious services, which was their evening worship around the fire, Bible-reading, praying, and singing hymns. Submit Adams was noted as being the first woman to keep house within the bounds of that township. James' house in St. Johnsbury burned at some point, destroying son Martin's Revolutionary War discharge papers. Submit died on 13 Nov 1797 at St. Johnsbury, at the age of 62. She was buried at Adams-Babcock cemetery in Waterford, Vermont. James then married Mrs. Trescott. James died in 1813 in Newport, Orleans co., Vermont, at the age of 78. He was buried on his farm in St. Johnsbury, Caledonia co., Vermont. James and Submit Adams had six children: Martin, Jonathan, Thirza, Clarissa "Polly", James Callender, and Charles. Sometimes interesting things happen when you start looking closely at data you haven’t seen in awhile. Putting together documents from an entire family and making a timeline can bring out some interesting scenarios, for instance, the disappearing daughters of Roland and Elizabeth (Wright) Sisson. Roland and Elizabeth were both natives of New York, probably Herkimer county where they lived with Roland’s father after their marriage. Roland was born in 1822, Elizabeth in 1825. Their first child, a girl named Rebecca, was born and died in 1848, living just past 2 months of age. Son James was born in 1849; he committed suicide at the age of 26, in 1875. Three daughters were then born, Ann, ca. 1851; Adeline “Addie”, ca. 1852, and Alice, ca. 1855. All presumably died before 18931. Sons Alvin and John were born next; both lived to adulthood. Next, four more daughters were born: Katie, ca. 1867-1872; Adelia/Alilia/Alelia, ca. 1869; Baby Girl, ca. 1874, and Sarah, birth year unknown, but d. 1861. Since she does not appear in the 1860 census, I’m assuming she was born later in 1860 or 1861, and had a very short life. The last two daughters, Adelia/Alilia/Alelia and Baby Girl, are difficult to sort out . Are these two separate daughters, or are they the same person? The 1875 Minnesota Territorial census shows both of these girls as Adelia, 6 and Baby Girl, 1. In 1880, only Alilia, 11, is listed, no mention of Baby Girl. Five years later, in 1885, the older girl would have been 16, and the baby, 11. Alelia, 16, is listed in that census. It would appear that Baby Girl died before 1880. The mother’s obituary (Elizabeth) says she died at the home of her daughter, Mrs. Blanchard of Spring Valley, in 1900. The census of 1900 has a Lela Blanchard living in Spring Valley with a birth date of Sept. 1868 – my Adelia/Alilia/Alelia was b. ca 1869. This is probably her. Besides her husband, she has two children, ages 9 and 7. I’m assuming a marriage date of ca. 1890 or earlier. Everything seems in order, until finding the 1895 Minnesota census of Elizabeth, then a widow, with daughter Luela in the household, age 21. This age fits perfectly with the Baby Girl listed in the 1875 census. The older sister, Mrs. Blanchard, would have been 26, and presumably married with both children born by then. I was unable to locate Mrs. Blanchard in the 1895 Minnesota census. I turned to the cemeteries for some additional help – Roland and Elizabeth are buried in Duff cemetery, a small but well-kept rural cemetery in the vicinity of their home. Also in that same area is Bateman cemetery, where I found daughters Katie and Sarah buried. I visited the cemetery in 2012, and found it in terrible condition, broken stones, in the middle of a corn field. Someone visited the cemetery in 2009 and uploaded photos to Find-A-Grave. The cemetery was mowed and green, and in much better shape. Their reading showed no other Sissons besides Katie and Sarah buried there. Left: Bateman cemetery, 2012. Right: The gravestone of Katie and Sarah Sisson. I have been through numerous cemeteries in this general vicinity, and made note of the Sisson graves I found, but cannot account for the missing daughters nor the son James who committed suicide. Obviously, they are buried somewhere, and more work needs to be done. 1Their father’s obituary was published in 1893, and three children survived him, Alvin, John and Lelia. Charlotte Debolt was my fifth great-grandmother, and someone I’m still getting to know. Information has been hard to come by, particularly concerning her relationship with her husband, and discovering the identity of her parents. Charlotte was married to Daniel Debolt, a man about fifteen years her senior. They were the parents of seven children, at least that I’ve been able to identify so far. The 1820 and 1830 censuses find them in Licking county, Ohio, and in 1840, Charlotte is still there and identified as “head of household.” Daniel seems to spend the remainder of his life in the households of two of his children, but not again with Charlotte. Charlotte and several of her children removed to Peoria county, Illinois, where she passed away in 1851 and is buried in Princeville cemetery. There’s certainly more to learn about Charlotte’s relationship with her husband, but I may be asking for too much. 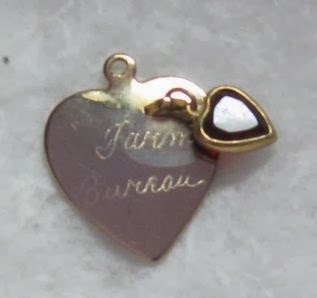 However, I may be having some luck in identifying her parents. I found a Charlotte Debolt listed in an index to abstracted wills in Washington county, Ohio. She was listed as an heir of Patrick Burnsides. My bubble was burst, however, when I saw that this Charlotte's husband was named William. But something kept bothering me, so I decided to see review my documentation of Charlotte. Agriculture was in Ray's blood, and after high school he continued to help his father on the family farm, then traveled the midwest as a hired man. Autumn of 1938 finds him at the University of Minnesota to work on a degree in agriculture. I don’t know what his plans were – go back to farming? Extension work? Something else? But he worked hard to pay his tuition, and was the first in his family to go to college. And then suddenly, between semesters, he enlisted. Did the attack on Pearl Harbor 3 weeks prior have anything to do with it? I don’t know, but before you can say, “What happened?” he’s at Scott Field in Illinois. One of his first letters home says he’s learning code and electricity, and eventually will learn radios. He’ll have to “work like heck to make it,” but hopes to make the grade as a radio man on a bomber, or an instructor. His scores on the exams are high - sometimes the highest. Well, he did work like heck, and he was eventually a navigator on one of the most wild rides a soldier could get – an assignment to a night fighter squadron. A typical radio class at Scott Field. Ray seemed to enjoy his time at Scott field – good food, comfortable bed, and only four men to a room. The food was so good, in fact, that he complained about his uniforms getting “a bit snug.” The only problem is that passes were hard to come by, even on the weekends, and for a guy like Ray who loves who loved to dance, well, that part did not go over well. The main mission of the Boca Raton AAF was radar training – a field that was considered top secret at that time. The personnel attending this school had to pass a “rigorous background investigation” and be among the most highly ranked candidates academically.2 During this time, Ray was also doing some instructing of some sort; his letters don’t say much, but do frequently mention his students. In March of 1943, 7 months after arriving at Boca Raton, Ray is still there, but anticipating being sent to Japan “any day now.” By the time of his next letter in June, he has been sent to Kissimmee, Florida, and would then go to the 417th Night Fighter Squadron by way of the British Isles for additional training. The night fighter assignments were so dangerous, men were considered on a volunteer basis only. I don't know what might have prompted Ray to ask for this hazardous work - perhaps an adventurous spirit, perhaps something else. From the British Isles, he began his career as a night fighter navigator in the European Theater. So much for going to Japan! Various Letters from Ray Christensen to his sister, Lillian. 1Wikipedia, Boca Raton Army Airfield. 2Wikipedia, Boca Raton Army Airfield. 30 years ago, as a new bride, I got this Betty Crocker cookbook from my dear Aunt Mabel. It was my first cookbook, and I consulted it frequently over the years, always thinking of her when I used it. It was not only myself using it, but my children and grandchildren learned to cook with this book open on the countertop. It is missing the front cover, pages are warped from being wet, and the pages with the best recipes have little bits of this and that stuck to the paper. Here and there, pages are torn from over-anxious children wanting to see what goodies were on the next page. Someday, when I’ve gone on to a better place, someone will be going through my belongings here on this earth. They’ll find this old cookbook and wonder why I still have it. “Was she unable to afford a new one?” they might ask. But little will they know, it’s this one that’s priceless. William Graves and his wife Becky Stretch will always be special to me, though I never even came close to meeting them. Back in the late 1990’s, when my interest in genealogy became re-kindled, it was with them that I began my research. Bill Graves was born 20 Nov 1820 in Chatham county, North Carolina to John and Elizabeth (Freeman) Graves, the fourth of twelve children. The following year, his family removed to Ross county, Ohio, where many of his father’s siblings had already gone. There he married Ann Ratcliff, daughter of Simon and Rachel (Dixon) Ratcliff in 1842, on his 22nd birthday. covered wagon, John took ill and died. Elizabeth painfully continued the preparations and continued westward. Everyone went except Bill and Ann – Bill owned about 210 acres of land in Liberty township, nearby that of his father-in-law, Simon Ratcliff. They continued on in Ross county with their children Simon, b. 1844; Martha Madaline, b. 1846; and Saran Ann, b. 1855. Their third child, James Newton, lived less than a month and was buried at Friends Church Cemetery near Londonderry, Ohio. Six months after the birth of her youngest child, Ann died, and was buried near her son. Six months after her death, Bill married Rebecca Stretch, daughter of Thomas and Rebecca (Rains) Stretch, who had helped out with the children after Ann’s death. About 1864, Bill, Becky, and their family set out to join the rest of Bill’s family in Illinois. Simon and “Madaline,” as she was called, went with their father, and Sarah Ann (“Annie”) stayed behind to be raised by her maternal grandparents. In addition to these two children, Bill and Becky’s family consisted of Cynthia (4) and Thomas (2), They purchased a farm in Peoria county, Illinois, just across the border from Stark county, and there they prospered. Their twin sons, Oscar and Austin, were born in 1870. Bill eventually had purchased enough land to give each of his children, including the girls, an 80-acre farm. William apparently retired at a fairly early age, as the younger children didn’t remember him working. According to his granddaughter, Myrtis, William never hurried at anything, and was an easy going man. He “made it a point to be out at the gate when he saw a wagon coming, which in those days of slow driving was not hard to do,” she said. He always went to bed before dark, never smoked, drank, or kept late hours, and lived a long life to show for it. He was also interested in his family’s history, and kept many of the birth and death dates in his Bible. Though his people had been Quakers, Bill never professed any certain religion himself, and saw no need to “pay a preacher to tell people how to live.” This perturbed his wife to no end, having been brought up in a church-going home, and the daughter of a choir-master. He did, however, insist that his children attend Sunday school. Rebecca suffered a fall, breaking her thigh bone, and died a month later, the official cause of death being tuberculosis. She passed away on 26 May, 1905 at the home of her daughter Cynthia. Bill then lived with his son Austin at Stringtown, just across the border in Stark county, where he died on 16 Jun 1908. Both Bill and Becky are buried at Sheets Cemetery in Stark county. Old Pins in a bag of "Junk"
I love to buy old buttons and pins from antique stores or garage sales. It's always interesting to see what odd things you'll find. This is a United Hagie Seed Twine pin. Perhaps the "5" is for someone's anniversary with the company, or a landmark anniversary for the company. If you look closely you can make out the kernels of corn around the perimeter of the pin. The red bucking mule is interesting as well. 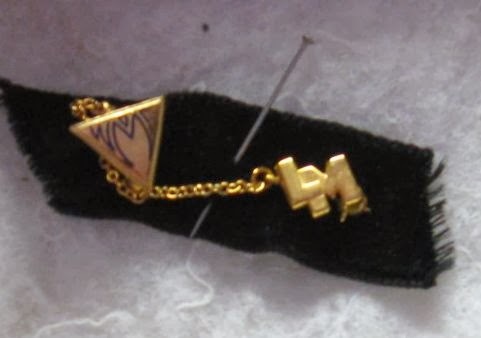 I've seen these Women's Relief Corps pins before - immediately under the badge hangs a "25 years" plaque with attachments for additional plaques for every 5 years served. The WRC is the official auxiliary to the Grand Army of the Republic (GAR). West Midland Farmers LM pin. I don't know anything about this organization or the significance of the pin. 3 gallons of blood donated to the Red Cross! 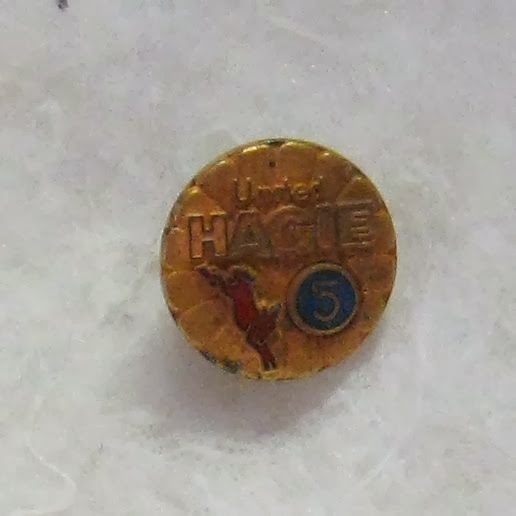 I have no idea what this pin is for. 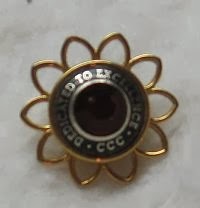 "Dedicated to Excellence - CCC"
The picture doesn't do justice to the pretty red jewel in the center. 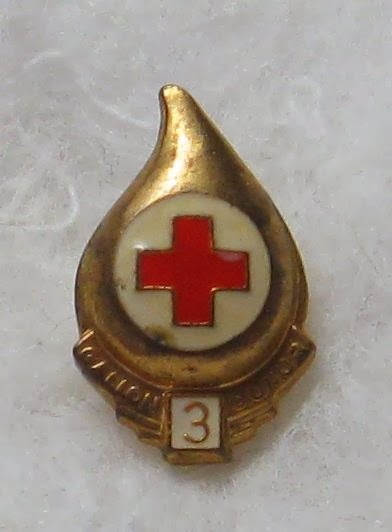 I could not find another example of this pin online, so I don't know what "CCC" stands for, or why this pin was produced.